Reduce the temperature by 1% in your home allows a saving of around 7% on its heating bill. 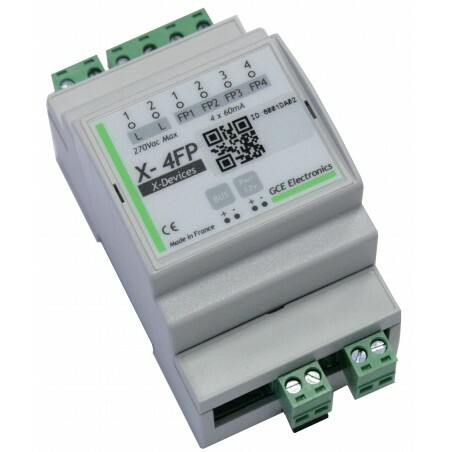 The extension X-4FP once connected to the IPX800 v4 allows to control 4 zones by pilot wire. Electric heaters and of course modern convectors are equipped with a pilot wire input. Shutdown, frost protection, eco, comfort -2, -1 comfort, comfort. this allows precise management of your heating according to time or any event. (open door, over temperature etc ...). • 1 Expansion Port (Bus EBX, shielded pair cable not included). • 6 modes: Comfort, Eco, Frost protection, shutdown, comfort -1 ° C, comfort -2 °C..
• 4 zones by extension cummulables jusqu'a16 zones ipx800 v4. • Power Indicator. • IP30. • Dimensions: 96x54x62. • Weight: 105g. • 12V DC power supply (not included). • Product made in France.